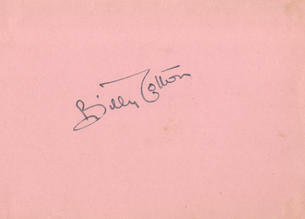 This is an In Person Ink Signed Autograph Album Page 5.5" x 4" by the Late Bandleader and Radio And Television Entertainer. William Edward Cotton (6 May 1899 - 25 March 1969), better known as Billy Cotton, was an English band leader and entertainer, one of the few whose orchestras survived the British dance band era. Today, he is mainly remembered as a 1950s and 1960s radio and television personality, although his musical talent emerged as early as the 1920s. In his younger years Billy Cotton was also an amateur footballer for Brentford F.C. (and later, for the then Athenian league club Wimbledon, now AFC Wimbledon), an accomplished racing driver and the owner of a Gipsy Moth which he piloted himself. Born in Smith Square, London, to Joseph and Susan Cotton, Cotton was a choirboy and started his musical career as a drummer. He enlisted in the Royal Fusiliers by falsifying his age and saw service in World War I in Malta and Egypt, before landing at Gallipoli in the middle of an artillery barrage. Later he was recommended for a commission and learned to fly Bristol Fighter aircraft. He flew solo for the first time in 1918, the same day the Royal Flying Corps became the Royal Air Force. He was then not yet 19 years old. In the inter-war years. he had several jobs such as bus driver before setting up his own orchestra, the London Savannah Band, in 1924. At first a straight dance band, over the years the London Savannah Band more and more tended towards music hall/vaudeville entertainment, introducing all sorts of visual and verbal humour in between songs. Famous musicians that played in Billy Cotton's band during the 1920s and 1930s included Arthur Rosebery, Syd Lipton and Nat Gonella. The band was also noted for their African American trombonist and tap dancer, Ellis Jackson. Their signature tune was "Somebody Stole My Gal", and they made numerous commercial recordings for Decca. During the Second World War Cotton and his band toured France with the Entertainments National Service Association (ENSA). After the war, he started his successful Sunday lunchtime radio show on BBC, the Billy Cotton Band Show, which ran from 1949 to 1968. In the 1950s composer Lionel Bart contributed comedy songs to the show. It regularly opened with the band's signature tune and Cotton's call of "Wakey Wakey". From 1957, it was also broadcast on BBC television. As a racing driver his finest moment came in 1949 when he finished fourth in the 1949 British Grand Prix, sharing an ERA with David Hampshire.